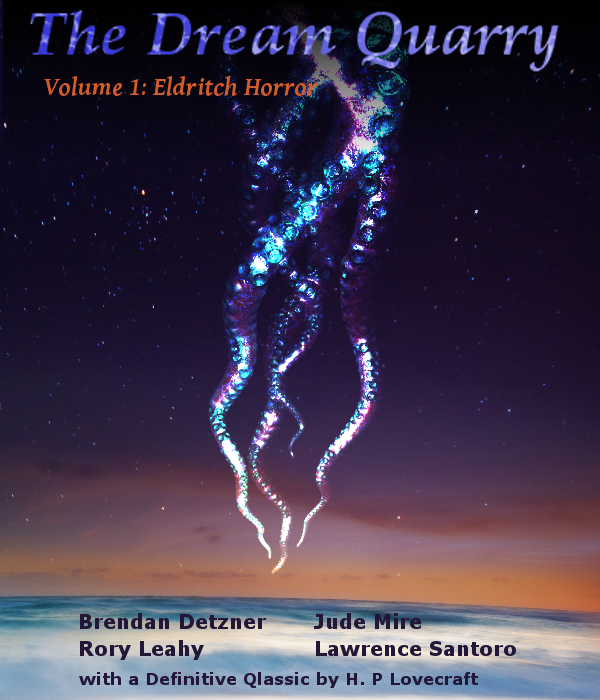 Welcome to the inaugural edition of The Dream Quarry — Volume 1: Eldritch Horror. Here you will find unspeakable horrors, of course, but also some humor, and perhaps even something a little poignant or thought-provoking. Kicking off the volume is a Bram Stoker Award nominated story from Lawrence Santoro, a darkly twisted-tongue-in-cheek tale from the Driftless Zone of the upper Midwest. (What’s the Driftless Zone? As the author himself said: look it up.) Next, Jude Mire brings us a story of loss and the blind desire to reclaim a ruined past. Then in the third act, the audience joins Rory Leahy to pull back the curtain on the real origins of theatre. Rounding out the featured fiction is the Brendan Detzner piece glimpsed in the Volume 1 Sneak Peak, a story involving the global climate crisis and an ex-pirate named Fuckmeat. Lastly, we have the promised H.P. Lovecraft tale, the first Dream Quarry Definitive Qlassic [sic]. “The Call of Cthulhu” awaits, but sadly guest editor Hunter Eden‘s introduction has been delayed, due to him being in the midst of an international move from the floodplains of Cairo, Egypt — where we can only imagine he was searching for a rumored surviving copy of the original Arabic text of the Necronomicon — to the high reaches of Denver, Colorado. Assuming Mr. Eden survives his exodus from Egypt with his sanity intact, his introduction will be added sometime in the coming months.